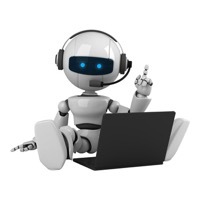 After almost seven months of hard work, we are proud to present version 2.6 of Chatbots.org. This version features multiple forums, a sophisticated account mechanism, and a sleek design of sub navigation, body, and footer. Summary: Chatbots.org has identified 49 professional chatbot/virtual agent developers. Including profiles and hyperlinks! Did you ever search for an overview of chatbot/virtual agent developers? Most likely, it was very hard to find. Well, we are happy to announce that from now on, life will be easier! Chatbots.org has identified 49 professional chatbot developers all over the world. 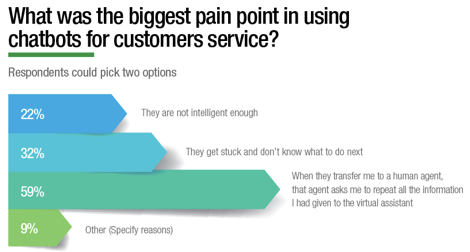 Most of them develop automated chat systems for virtual agents in call centers, however many developers are also developing chatbots for entertainment, learning, or companionship. Below, you will find a summary of our initial results in alphabetical order. 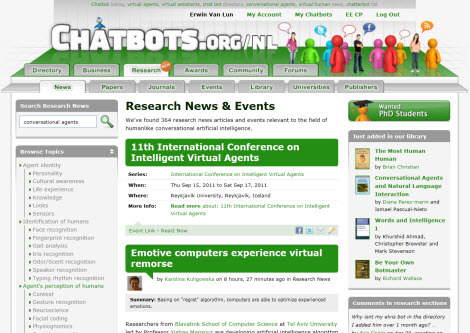 This page is a snapshot of our database listing Nov 18th 2009, our dynamic directory of professional chatbot/ virtual developers is maintained continuously and contains hyperlinks to developers’ websites. AI4US Ltd. is from now on legal person for Chatbots.org. Its name AI4US is an acronym of ‘Artificial Intelligence for us’, its mission is to support the use of Artificial Intelligence in people’s daily lives. It’s registered at the English Company House, Company No. 7045061. All shares are owned by Lun Holding Ltd. (registered Company No. 7051180), which is fully owned by Dutch futurist Erwin Van Lun (that’s me ; - )). How to model natural full-body conversations between humans and chatbots, agents or humanoids? What elements are important from the very first moment a conversation seems to start until a real almost intimate relationship has been built (or it’s time to say goodbye)? At Chatbots.org, we’re extremely interested in these elements as we’re trying to structure current and future parts of this website based on those elements. Therefore, we’ve worked quite extentisvely on this model althought it’s still a draft. Read the 9 main stages below, download the full PDF(Human Agent Model Elements) and you’re invited to leave your comments and suggestions! Chatbots.org 2.5: Awards, featured profiles and awesome design! Summary: New Chatbots.org: all AI awards+feature profiles of individuals +brand new design, and fast! 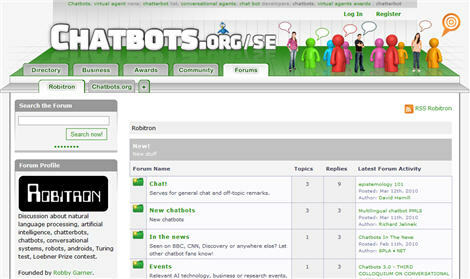 Three months after release 2.0, we are very proud to present version 2.5 of Chatbots.org. Version 2.5 features all chatbots and/ or related AI awards, a special ‘feature profiles’ section highlighting everyone who has willingly shared their AI knowledge and a brand new design of the Chatbots.org header, including animated favicon and cute Twitter animation. In addition, the speed of the website has considerably increased. 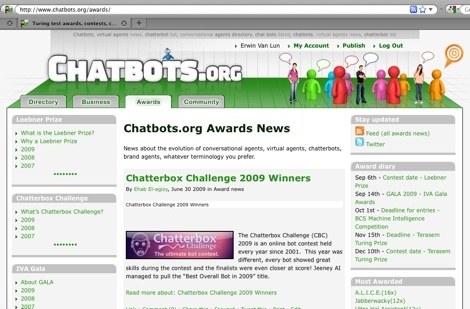 Read more about: Chatbots.org 2.5: Awards, featured profiles and awesome design! Do you enjoy digging around the Internet spotting just those academic in-depth articles who nobody ever seems to discover, AI pearls who deserve more attention? Can you think outside of the box? Do you have proven experience as a creative writer attracting different kinds of people? Act now! Summary: Wanted: AI & SF book reviewers - looking for a flexible job? Do you love AI and SF books? That’s great! We’ve just started to build our library, so we could be of assistance to each other! 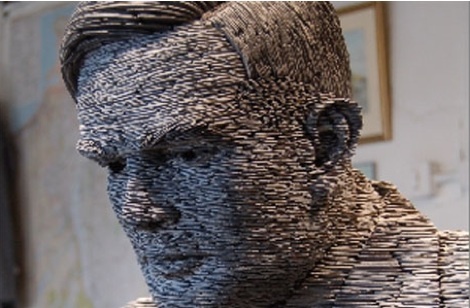 We’ll need objective book summaries and subjective book reviews of great AI and SF books (and even movies).